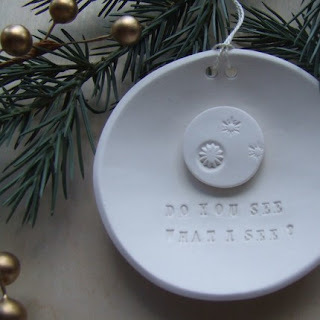 Spotted over in the beautiful Etsy shop, Paloma's Nest: this uniquely ovely ceramic ornament. There are several gorgeous pieces from which to choose, all with great sentiments from "All Is Calm" to "Thank You." These would looks stunning on a tree which is decorated solely in silver and white. Check out the ornaments at Paloma's Nest today. She has recently been featured in Better Homes and Gardens, too! Congrats on this achievement.